This week, I wanted to feature a series of art prints from my Black And White Photography Gallery. I’m going to refer to this series as “The Barns”. I love black and white photography because you can create interesting moods with a monochrome approach. The subject of the print must possess enough contrast, lines and shading to help the photographer present the story they are trying to tell. Since I shoot in digital, it allows me the ability to play with the final subject matter so much more than when I used film. I shoot in RAW format to allow me the most options in presenting the final print. When I see shots I’ve taken that I think would look great in black and white, I adjust the picture to a monochrome status and then start playing with the level of detail, the amount of contrast and brightness to create an image that I think tells a story. The setting for these shots is Eastern Iowa in the wintertime. There isn’t any snow on the ground, but it is cold and the trees are barren. The overall look of the countryside just speaks “Black and White” to me. The first shot is a large barn with interesting cupolas on the roof. I thought it made the overall architecture of the barn that much more interesting. I played with the contrast, lighting and detail to allow the clouds to become a more important element of the shot. This next print has become one of my favorites, simply because I love the hand pump. It just sits there in the yard right in front of the stables, but speaks volumes to me about life on the farm. I love the combination of elements between the stables and that simple little hand pump. 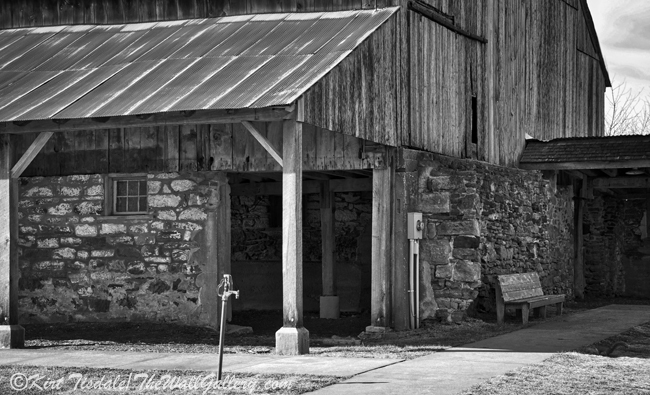 The third shot is the entire barn and stables from the previous capture. The location is the Amana Colonies in Eastern Iowa, south of Cedar Rapids and west of Iowa City. In this photograph, I wanted the clouds to add to the texture of the presentation. I had to play with the same three elements to get the right balance, as the clouds required a higher amount of detail and contrast to get them to pop like this. The fourth picture is the same structure, but from the side. 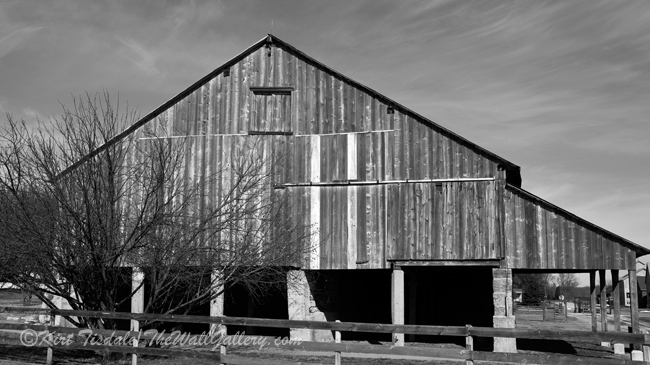 In this one, I downplayed the clouds because I wanted the focus to become the rough texture of the siding of the barn. I love the rough grain of the wood and wanted that to dominate this particular photograph. The last one is an old hay barn located near the large stables and barn. 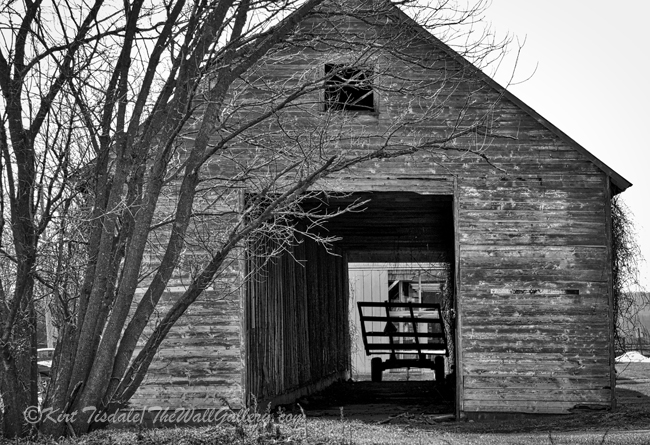 I was going for the rough texture and age of the wood siding of this hay barn. I love the depth of this shot as you can see through the entire barn and I was lucky enough to get it with an empty hay wagon sitting inside. Thoughts? I invite you to visit my Black and White Photography 1 Gallery to enjoy these prints and many more. 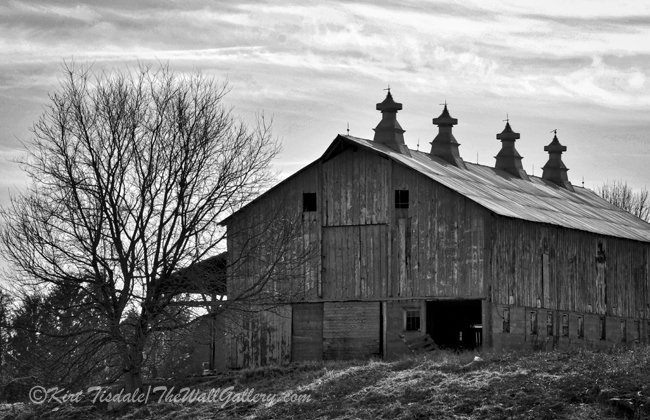 This entry was posted in Black and White Photography, Photography and tagged Barns, farms, Iowa, kirt tisdale, online art gallery, photographer on May 31, 2015 by Kirt D Tisdale. 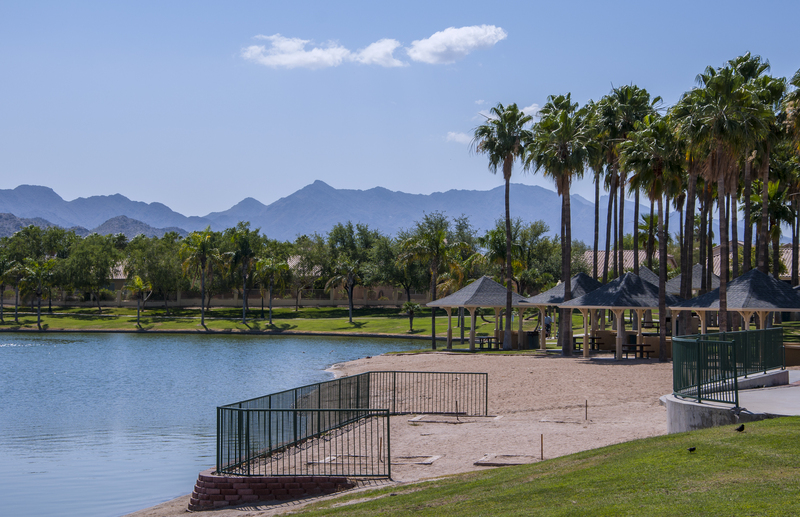 In our community, we have two lakes that are the focal point for a lot of social activities. 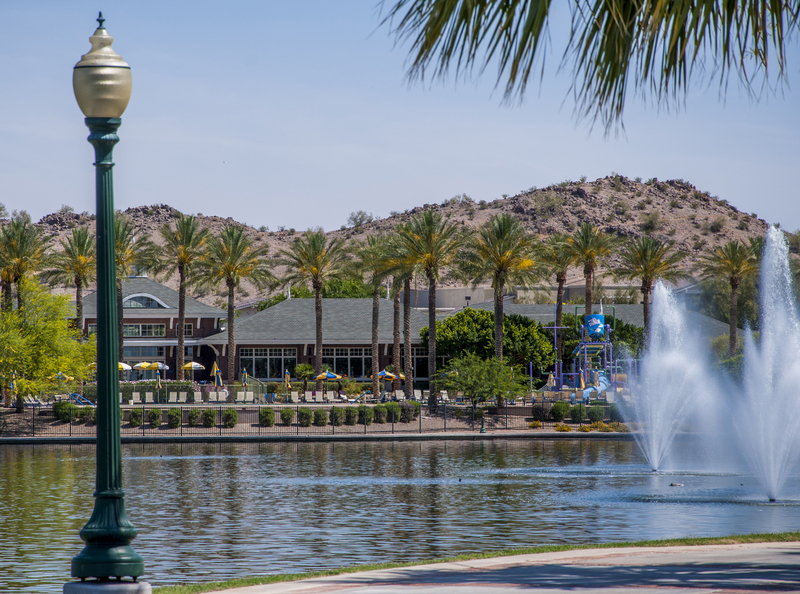 Around the lakes, it is a park setting with a continuous wide sidewalk that always has walkers and joggers enjoying the fresh air and outdoors. The lakes are not physically connected, but sit right by each other. The sidewalk connects them for all of us to easily go between the two. They are called North Lake and South Lake. I love the creativity in the names (yes, sarcasm) and frankly would argue that they aren’t really lakes, but large ponds. It is 2.5 miles around both of them, so we are talking “large ponds”. Both are man made and serve more than just aesthetic beauty. They actually hold recycled water that is used throughout the community to water the vegetation. You must remember, this is Arizona and we are in a desert, but we have learned early on, how to utilize water wisely. And with that said, since it is Arizona and we’ll take what we can get in water…the term Lakes works. I decided to get up early last Saturday morning and take a walk around the two lakes. I’ve attached six shots from my morning adventure. 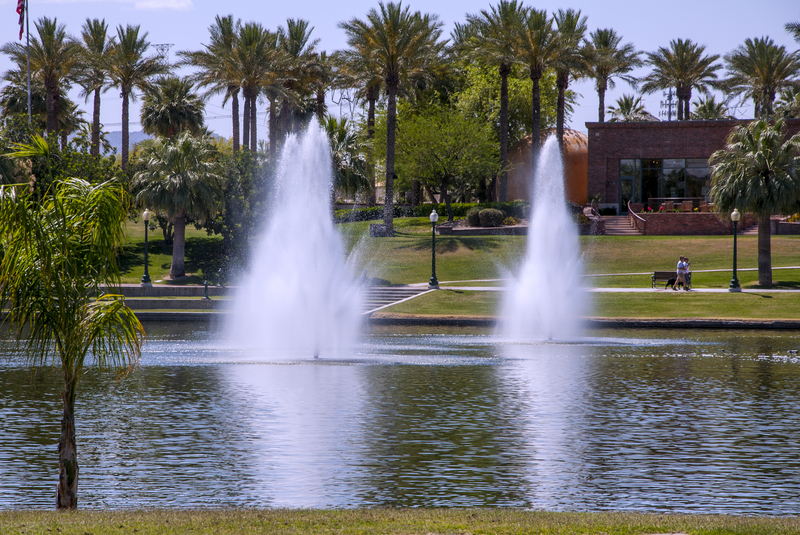 The first shot is at the end of North Lake where there is an open-air amphitheater in the lawn stepping down to the lake with the water fountains as backdrops. Throughout the year concerts are held here representing a variety of music. Notice the early morning couple walking their dog. As I said earlier, the sidewalk and the lamppost go the full 2.5 miles around the lakes with sidewalk connectors into various neighborhoods. 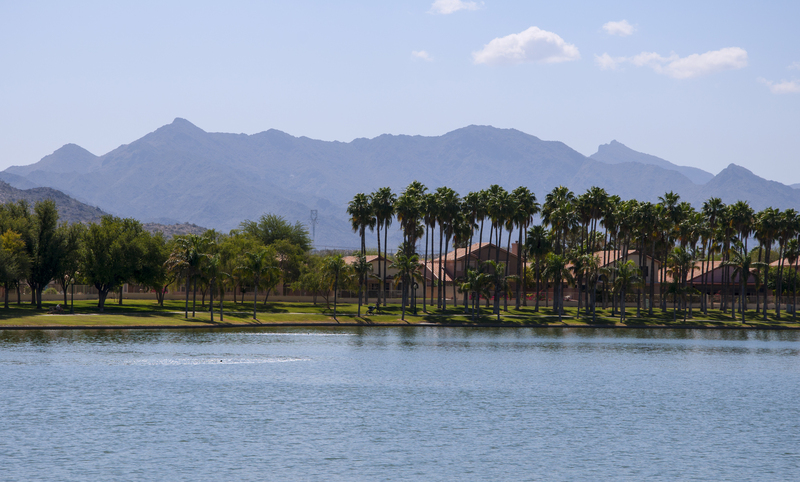 The second shot is from South Lake looking back east towards the Estrella Mountains as a backdrop. 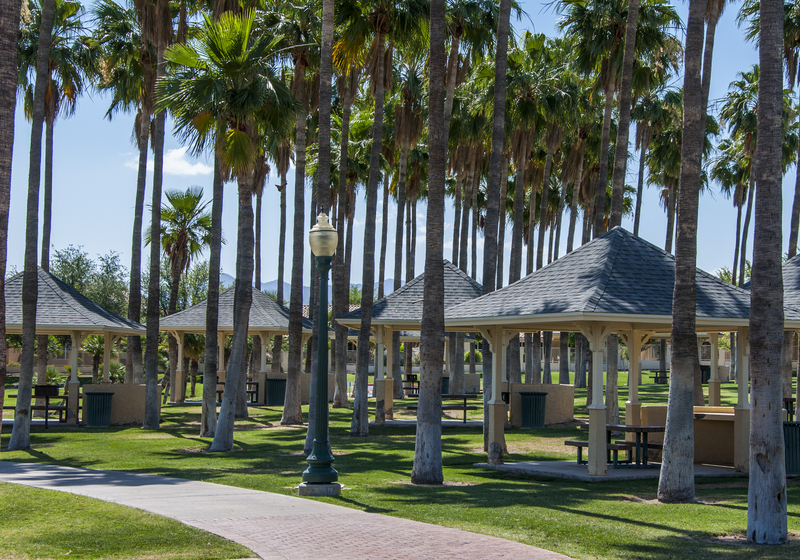 If you look real close along the sidewalk, you’ll see a parent pushing a stroller coming out from under the Palm trees and to the far left, a gentleman sitting on a park bench. The third shot shows the end of South Lake, where there is a large park hosting tennis courts, picnic pavilions, playground equipment and a boat ramp for very small boats. The fourth shot shows the sidewalk as it winds its way through the picnic pavilions. The fifth shot takes us back over to North Lake, where there is a clubhouse hosting a swimming pool and water features that help beat the heat for all ages from young kids up to….well, let’s just say people my age and older. The last shot is the dock, which sits close to the clubhouse. 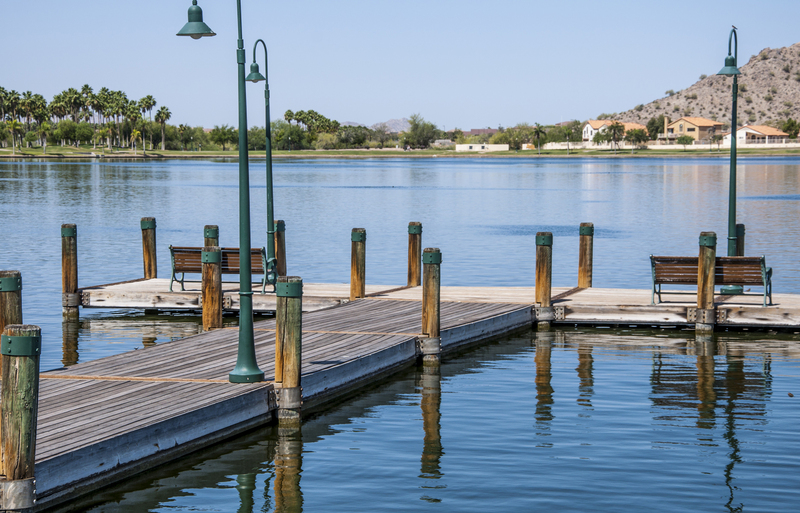 From here you can get kayaks, paddle-boards and small sailboats to go out on the water. Our heat hasn’t gotten too intense yet, so as the day progressed, so did the activity around the lakes. As a side note, I mentioned the lampposts that go along the sidewalk around both lakes…summer nights are a great time to also take the walk as it is well lit, the temperature is more tolerable and the lights reflecting off the water …beautiful. I feel another photo shoot opportunity! Thoughts? This entry was posted in Color Photography, Photography and tagged arizona, desert, kirt tisdale, lakes, online art gallery, park, photographer, ponds, sierra estrella mountains on May 25, 2015 by Kirt D Tisdale. 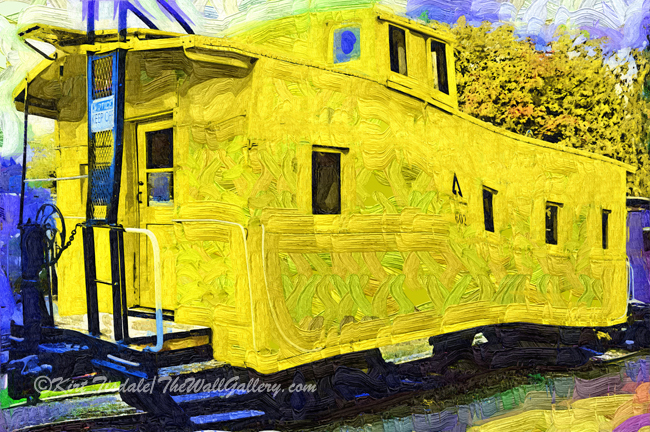 This week, I wanted to feature an art print that shouts out with bold color, titled; A Bright Yellow Caboose!!! Talk about bright and talk about yellow!! To create this art print, I used a fauvism style oil technique. This technique uses bold brush strokes, abstract shapes and surreal colors, creating a very contemporary look. This particular wall art print depicts a yellow caboose located on the grounds of the Issaquah Depot Museum, a preservation of a piece of important history in this part of the Pacific Northwest. The setting is Issaquah, Washington and the Issaquah Depot Museum. Using some license with this bright colored abstract piece, my goal was to depict a yellow caboose sitting on the track at the station. The Issaquah train station was an important stop along the railroad route from downtown Seattle to the mountain towns in the Cascades. Issaquah sits in the foothills of the Cascade Mountain Range and is now an eastern suburb of the Seattle metropolitan area. The train station has been refurbished and now sits as a museum along the abandoned tracks it once served. Thoughts? I invite you to visit my Architecture Gallery to enjoy this print and many more. 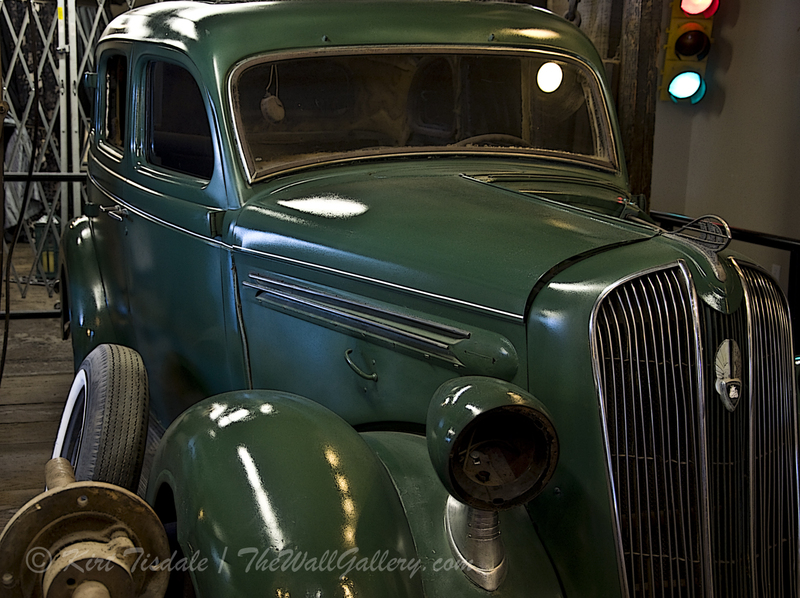 This entry was posted in Abstract Oil, Art Prints and tagged abstract art prints, art galleries, artist kirt tisdale, caboose, interior design, Issaquah Railroad Station Museum, issaquah washington, online art gallery on May 18, 2015 by Kirt D Tisdale. 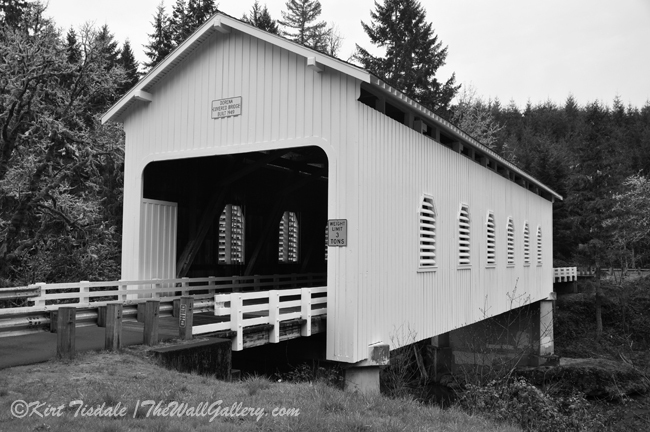 I have attached four prints of covered bridges in the state of Oregon, from my Black and White Photography One Gallery. These particular bridges are located in the west quadrant of Oregon north of Grants Pass up to Cottage Grove south of Eugene. They were a quick detour off of Interstate 5 (which winds its way up and down the entire US West Coast from Canada to Mexico) done on a rainy day in early spring. The first shot is of the Grave Creek Covered Bridge, which was built in 1920. This bridge is located 14 miles north of Grants Pass, Oregon right off of Interstate 5. 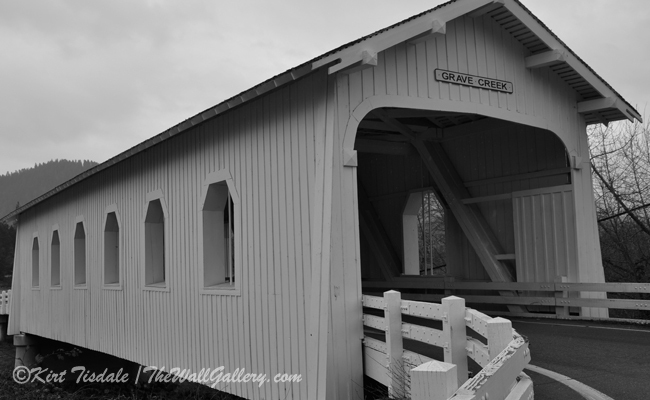 The next shot is the Neal Lane Covered Bridge, which spans Myrtle Creek and is located north of Grants Pass also. The bridge was originally built in 1929. This bridge I lovingly call the “Short Covered Bridge” as the span of the bridge is only 42 feet. The third capture is the Stewart Bridge, which spans Mosby Creek and is located east of Cottage Grove (Cottage Grove is along Interstate 5 between Grants Pass and Eugene). The bridge was originally built in 1930. 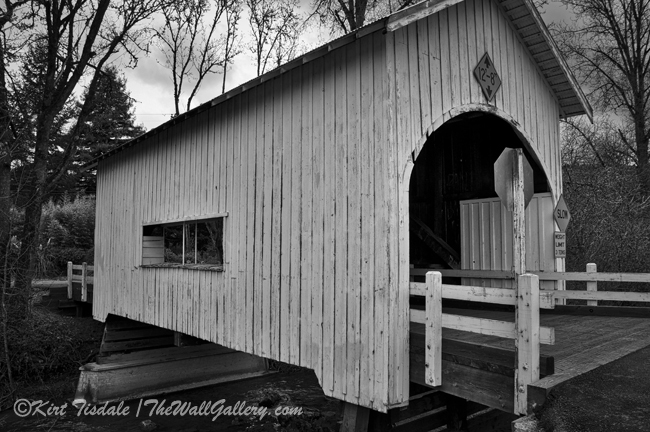 The last print is of the Dorena Covered Bridge that spans the Row River. It was built in 1949. It is located further east of Cottage Grove than the Stewart Bridge at the upper end of Dorena Reservoir. I think this presentation in black and white captured the mood of a cool rainy day and the age of the bridges. Thoughts? I invite you to visit my Black and White Photography One Gallery to enjoy these prints and many more. 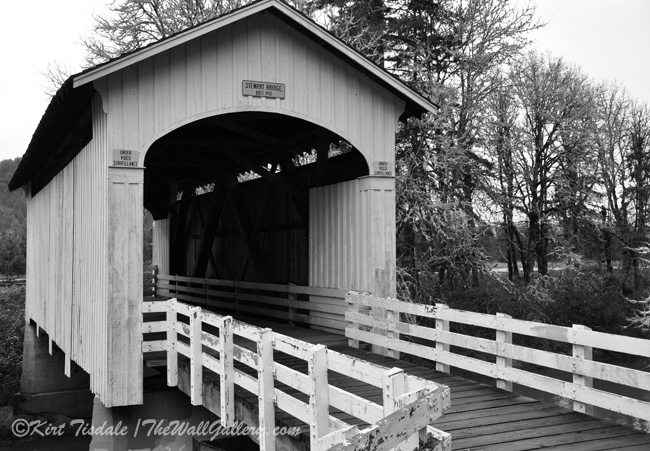 This entry was posted in Art Prints, Black and White Photography and tagged black and white photography, covered bridges, covered bridges oregon, interior design, kirt tisdale, online art gallery, photographer, photography on May 11, 2015 by Kirt D Tisdale. 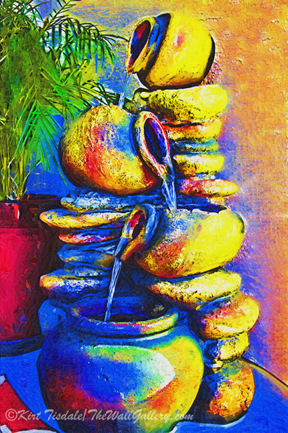 I just completed a new art print for my Gardens Gallery titled: The Fountain Of Pots. 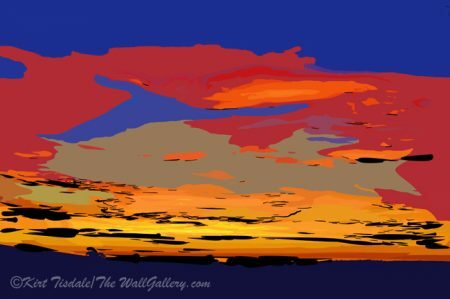 In this wall art print, I used a fauvism oil technique creating this scene. This technique uses bold abstract brush strokes and strong, bright surreal colors. The wall art print is of a fountain next to a potted palm plant. The setting is a patio fountain created using pots stacked on rocks top to bottom creating the trickling water effect. Next to the fountain is a potted palm, which adds an additional element to the scene. I chose to do the print in an abstract style reminiscent of fauvism to really pull out the shapes of the main element of this art print, the fountain itself. The abstract approach and surreal colors create a fun, playful image of this patio fountain. Thoughts? I invite you to visit my Gardens Gallery to enjoy this print and many more. 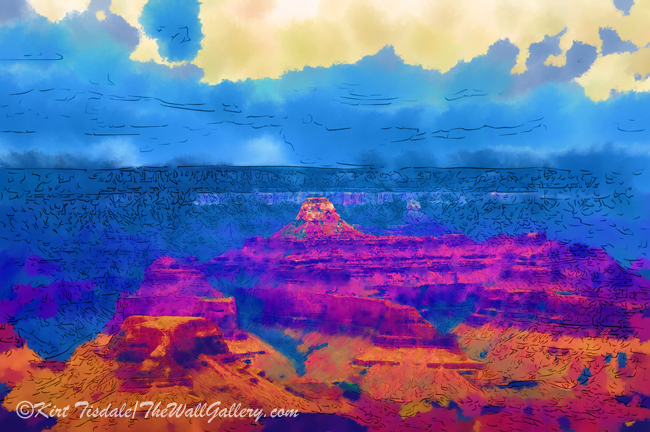 This entry was posted in Abstract Oil, Art Prints and tagged abstract art prints, art prints, artist kirt tisdale, fountain, fountains, Garden, interior design, online art gallery, patio on May 4, 2015 by Kirt D Tisdale.